Getting Banned from the LA Review of Books: a series of posts by Ron Koertge, Ellen Hopkins, Susan Patron, Lauren Myracle, Sonya Sones. 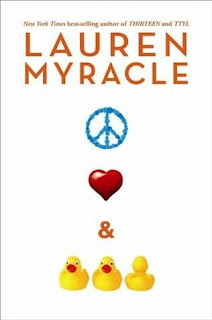 Peek from Lauren: "...every book deserves a fair shake, regardless of its perceived moral stance, its alleged ugliness or depravity, or the number of lives it has or hasn’t saved." Nominate a Book for the Cybils 2011: Children's and Young Adult Bloggers' Literary Awards. But first check out the New Eligibility Rules. What Agents Want: The SCBWI British Isles Agents Party by Addy Farmer, Candy Gourlay and Teri Terry from Notes from the Slushpile. See also SCBWI 2011 Agents Party from J.E. Towey. 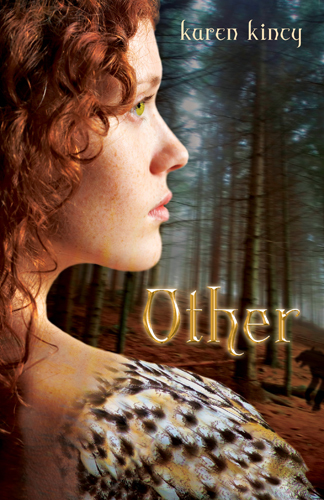 Psychology in Fiction: Q&A Brainwashing by Carolyn Kaufman from QueryTracker.netBlog. Peek: "The first technique anyone will use if they want to persuade someone is repetition -- saying the same thing over and over in a convincing way. Repetition can be very powerful." Who's Afraid of Thomas Wolfe? by Louise Hawes from Write at Your Own Risk. Peek: "That's where I met another, newly arrived Writer in Residence (there are four bedrooms at Weymouth, with space for four lucky authors). She asked me which room I was in, and when I told her, she replied with delight, 'Oh, you got the haunted room!'" The Rodent Brain Approach by Audrey Vernick from Shrinking Violet Promotions. 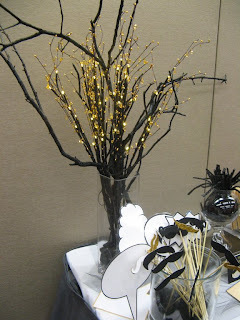 Peek: "I’m also taking pleasure in the connections I’m forging with authors and illustrators through my blog. By learning how inspired they were by the authors and illustrators who came before them—authors and illustrators who probably didn’t worry about social media expectations and effective platforms." Future Fragments: YA Dystopias Beyond The Hunger Games from CC2K. Note: an annotated bibliography of recommended reads. 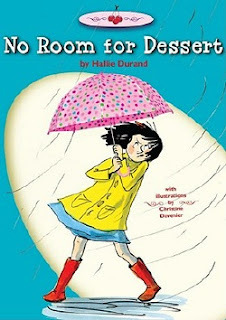 Chatting with Hallie Durand about No Room for Dessert by Jama Rattigan from Jama's Alphabet Soup. Peek: "...she’s probably quite a lot like me as a kid (and I’m not sure that’s a compliment). I was the third kid and I often got away with more mischief than my older sisters, simply because I wasn’t watched as closely." Storybook apps for kids a major topic among children's book writers and artists by Omar Gallaga from The Austin American-Statesman. Peek: "At the end of the day, though, there's no substitute for a good, well-told story and memorable characters, we've found." Last call! Register for "Storytelling in the Digital Age: Embrace the Change," sponsored by Austin SCBWI and scheduled for Oct. 8 at St. Edward's University. Interview with Denise Johnstone-Burt, Publisher and Associate Director at Walker Books in the U.K. from papertigersblog. Peek: "I always sit down with an author or illustrator when they have a new idea for a picture book, for example, and he or she will talk me through the new idea. Then we discuss what the story is about, what the emotional heart of the story is and whether the shape of the story is right." Congratulations to Mitali Perkins on the release of White House Rules in India! The Children's War: A journal about books for children and teenagers set in World War II from Alex Baugh. "This includes books written during and after the war, fiction and nonfiction." Interview with My Bully: The Courage to Remember by Janni Lee Simner from Salon.com. Peek: "As the author's writing career blossomed, old classmates got back in touch. But only one faced up to the truth." Almost Everything You've Ever Wanted to Know about Clete Barrett Smith by Pippa Bayliss from The Enchanted Inkpot. Peek: "I actually received two Hollywood offers before the manuscript ever went out to publishers. An executive at the Disney Channel made an offer to purchase the rights to the characters for an animated series and then producers associated with the Disney movie studios offered a contract for an option on the movie rights." 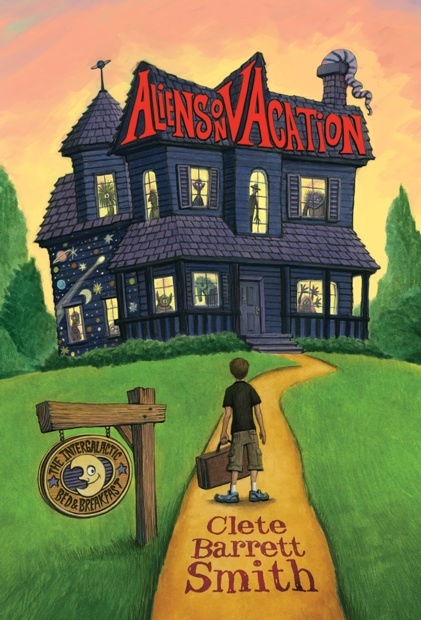 See also a recommendation of Clete's Aliens on Vacation from Greg Leitich Smith at GregLSBlog. Writing Through Interruptions by Kristi Holl from Writer's First Aid. Peek: "So few of us live on a deserted island. Most writers–probably 90% or more–have to deal with distractions and interruptions." Touching Silence by Uma Krishnaswami from Writing with a Broken Tusk. Peek: "The desert rescues me at such times. It gives me sky and 360 degrees of horizon, and silence." Voices You Should Hear: Tami Lewis Brown from Janet Fox at Through the Wardrobe. Peek: "Great middle grade authors put me in the mind of butterfly hunters as they catch elusive ideas with nets spun of prose, trapping tough concepts just long enough for young readers to observe and understand truths." It's Boom Time for Children's Books from The Telegraph (U.K.). Peek: "Festivals are thriving and children's books sales are outperforming the rest of the market as Children's Book Week starts." The Portable Brain: Keeping an Idea Notebook by Ash Krafton from QueryTracker.netBlog. Peek: "My notebook holds more than just words, those hastily scribbled lines that come to me when I’m on the way to work. It’s got song lyrics and photographs. Web links and museum tickets. I think it may even contain a playlist for every story I ever started." Richard Jesse Watson on the Power of Illustrators To Portray Diversity of Gender from Lee Wind at I'm Here. I'm Queer. What the Hell Do I Read? Peek: "...he told me about how he approached the gender of an angel in his illustrations for The High Rise Glorious Skittle Skat Roarious Sky Pie Angel Food Cake, written by Nancy Willard." Tidbits and Trivia about Roald Dahl (part 1, part 2) from Gathering Books. Peek: "Before he started writing, Roald made sure he had six sharpened pencils in a jar by his side. They lasted for two hours before needing to be resharpened." Building Online Communities for Teen Readers from Publishing Perspectives. Peek: "These websites offer readers a game-ified experience of popular YA titles, essential in an age where digital engagement is key to finding and maintaining an audience. The trick then becomes how to tap into those audiences and offer services and programs that invite participation, not only enticing audiences but maintaining their interest as well." Source: April Henry. All-ages Reader: Brian Selznick is Wonderstruck by Zack Smith from Newsarama. Peek: "That always really interested me in terms of what you can do with the page turn – the physical act and how it can be part of the storytelling, of the narrative. I’m interested in how stories are told, and I’d never really seen a novel that incorporated the page turn in the way that it’s used in picture books." See part two. Celebrate! October is National Book Month from the National Book Foundation. Peek: "You've already discovered the ultimate book lover's destination for great ideas on how to bring the power of reading into your life." Source: Phil Guinta. My Name is Elizabeth! by Annika Dunklee, illustrated by Matthew Forsythe: a peek at interior illustrations and thoughts from Jules at Seven Impossible Things Before Breakfast. Peek: "Elizabeth Alfreda Roxanne Carmelita Bluebell Jones really loves her first name. She likes that it is nine letters long. She likes all the neat things her mouth does when she says it. She likes that there is a queen named after her." Characters Must Not Always Be What They Seem by Matthew MacNish from Project Mayhem: The Manic Minds of Middle Grade Authors. Peek: "I have a rather large cast in my novel, and there is very little space to give deep characterization to all the people in my story, but you'd be surprised how little can go a long way." Looking for more links? Try Publishing Pulse from QueryTracker.netBlog and Best Articles This Week for Writers from Adventures in Children's Publishing. Last call! Attention U.S./Canada readers! Enter to win a signed copy of Lost in Time by Melissa de la Cruz (Hyperion, 2011). To enter, comment on this post (click immediately preceding link and scroll) and include an email address (formatted like: cynthia at cynthialeitichsmith dot com) or a link to an email address. Or you can email me directly with "Lost in Time" in the subject line. Author-sponsored. Deadline: Oct. 10. Eligibility: U.S./Canada. Good luck! Enter the world of Liesl & Po by Lauren Oliver with an animated book trailer featuring the official Liesl & Po song: "A Train with Wings." Source: BooksnStories. After Scott Westerfeld's amazing keynote last weekend at Austin Teen Book Festival, everyone was buzzing about steampunk. Learn more about it in this video from PBS Arts. 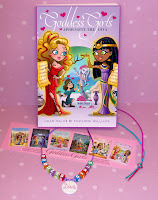 Enter to win an Aphrodite the Diva Swag Giveaway, courtesy of authors Joan Holub and Suzanne Williams.To enter, comment on this post (click immediately preceding link and scroll) and include an email address (formatted like: cynthia at cynthialeitichsmith dot com) or a link to an email address. Or you can email me directly with "Aphrodite the Diva" in the subject line. Author-sponsored. Eligibility: U.S./Canada entries only. Deadline: Oct. 23. 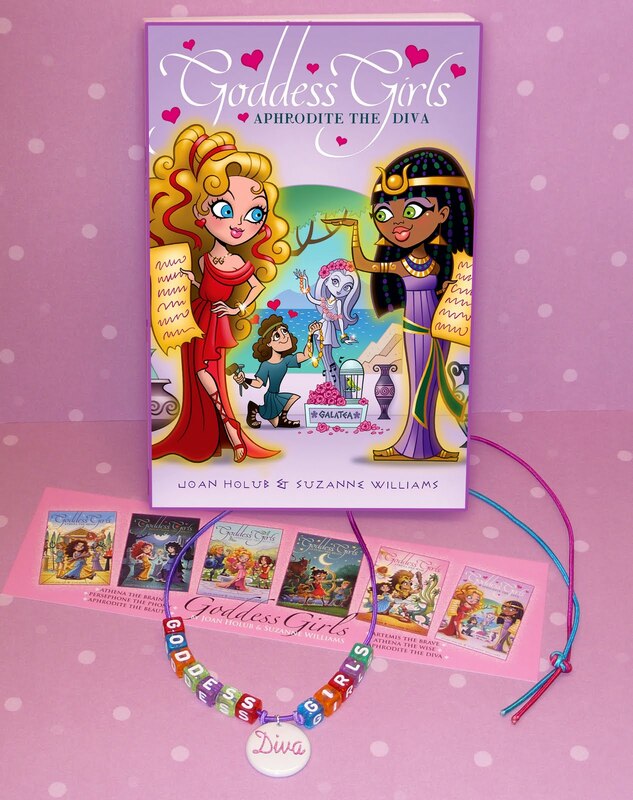 See also a Cynsations guest post by Joan and Suzanne on Sustaining a Children's Book Series Over Time. Peek: "Every book is populated by a familiar cast of Greek gods, goddesses, demigods, and mortals—all students at Mount Olympus Academy. Sometimes, as with Book 6, we also bring in characters like the Egyptian goddess, Isis, from other pantheons. All the books have an actual Greek myth or two at their cores." 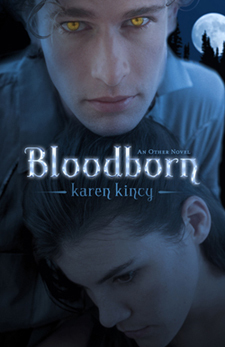 Enter to win a copy of Other (2010) and/or Bloodborn (2011) by Karen Kincy, both from Flux. To enter, comment on this post (click immediately preceding link and scroll) and include an email address (formatted like: cynthia at cynthialeitichsmith dot com) or a link to an email address. Or you can email me directly with "Other," "Bloodborn" or "Other/Bloodborn" in the subject line. Publisher-sponsored. Eligibility: North America (U.S./Canada) Deadline: Oct. 14. Read a Cynsations interview with Karen. North America readers! See also the giveaway of a signed copy of Lost in Time by Melissa de la Cruz (Hyperion, 2011), listed under "screening room" above. Or find out more at this post (click immediately preceding link and scroll). To enter, comment on this post (click immediately preceding link and scroll) and include an email address (formatted like: cynthia at cynthialeitichsmith dot com) or a link to an email address. 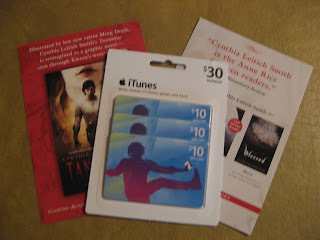 Or you can email me directly with "Blessed/TKS Giveaway" in the subject line. Author-publisher sponsored. Deadline: Oct. 17. Enter to win an illustrator-signed copy of Tantalize: Kieren's Story from A.C. Gaughen. Deadline: midnight EST Oct. 7. Last call! Enter to win one of three sets of ten signed Tantalize: Kieren's Story graphic novel postcards, each with a $10 iTunes gift card. To enter, comment at this post (click immediately preceding link and scroll) and include an email address (formatted like: cynthia at cynthialeitichsmith dot com) or a link to an email address. Or you can email me directly with "iTunes/postcard set" in the subject line. You may earn extra chances to win by blogging, posting at social networks, or tweeting about this giveaway. Detail efforts in your entry. Five entries maximum per person. If you are a public/school librarian, university professor of youth literature/education/library science, or a children's-YA bookseller, you may include that information in your entry with a link to your school/public library, university department, or bookstore website for an extra chance to win. 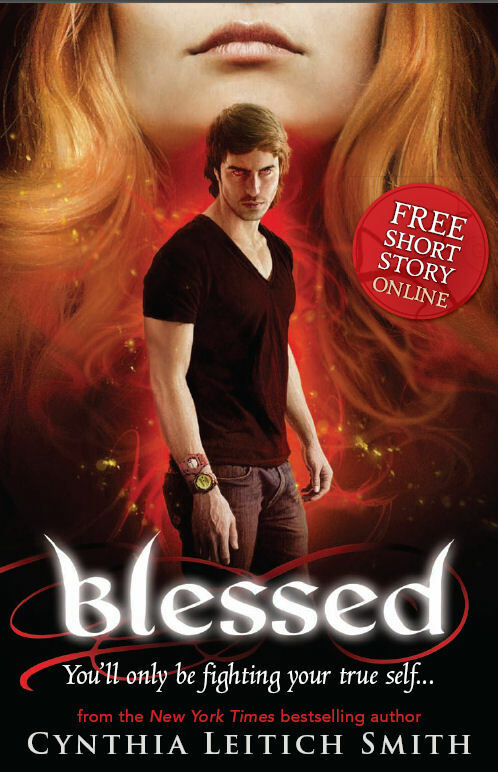 Blessed is now available from Walker (U.K.) and Tantalize: Kieren's Story, illustrated by Ming Doyle, is now available from Walker (U.K.) and Walker Australia and New Zealand. See related giveaways above! Note: I'm honored to report that Blessed is a Cybils nominee in teen science fiction/fantasy. 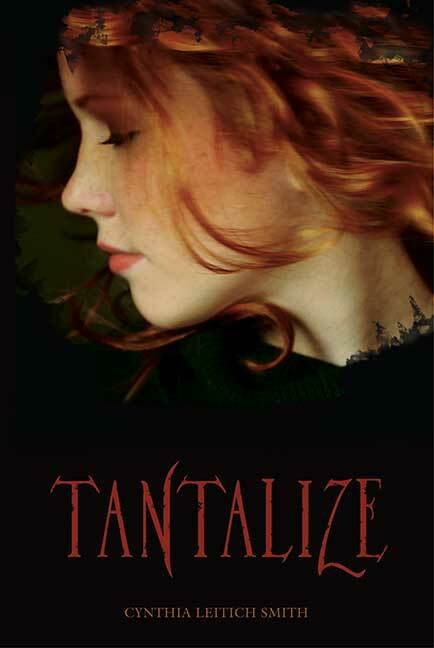 Have you been waiting for a chance to read Tantalize (Candlewick, 2007, 2009)? It's a highlighted October sale title for Kindle readers! You can purchase the e-book for $2.99 (67% off)! See a complete list (with links) of children's-YA ebooks on sale for Kindle/Amazon.com readers from author Cheryl Rainfield. Can't wait for the release of book 4, Diabolical (Candlewick, Jan. 2012)? You can get a hint of what's to come from Books Under the Blanket. Peek: "I've already pre-ordered multiple copies so that I can get it into students' hands the day it is released because I know they are going to love it." Don't miss: Up the Wattage: Highlighting Your Books and Byline, in which I talk about low-effort, high impact ways for authors (and illustrators, too) to maximize the promotional effectiveness of their web presence. Grab a mustache at Austin Teen Book Festival! Last week's highlight was the Austin Teen Book Festival, presented by the Austin Public Library Friends Foundation. With over 2,500 teens in attendance--double last year, it was a huge success! Special thanks to festival director Heather Schubert, volunteer coordinator Leslie Wilson, the volunteers, Austin Public Library Friends Foundation, and BookPeople. Thanks also to everyone in attendance and/or who otherwise contributed to making the event such a success. See my full event report. 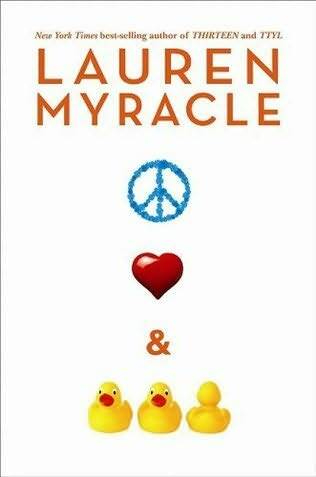 See also Austin Teen Book Festival Wrap-Up from Greg Leitich Smith at GregLSBlog. Smith and Doyle on Drake from J.L. Bell from Oz and Ends, quoting from a Newsarama interview. Follow @jlbellwriter. More Than One Way to Read with Barry Lyga and Cynthia Leitich Smith from 11:30 to 12:30 in Capitol Extension Room E2.010 Oct. 22 at the Texas Book Festival. Signings to follow. 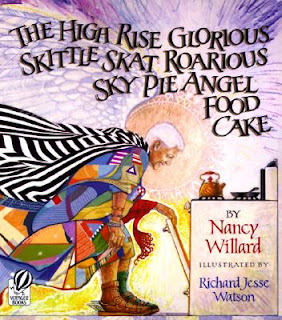 See also 2011 Texas Book Festival Children's-YA Programming from Greg Leitich Smith at GregLSBlog. New York Public Library Children’s Literary Salon on the topic of Fiction and the Military Family with authors Rosanne Parry, Suzanne Morgan Williams and Sara Lewis Holmes on Nov. 12. See also Rosanne on Children's-YA Fiction and the Military Family.